Teaching your body how to get along with ease and efficiency. We are a group of classically trained teachers who will work with you to improve your posture and alignment, strengthen your body and understand your breath. Our goal is to bring your body back to health. At Zalla you will integrate mind and body, all while building strength, flexibility and endurance. We believe Pilates is a system of exercises and an endless discovery of how our bodies move. We invite you to explore and learn with us! 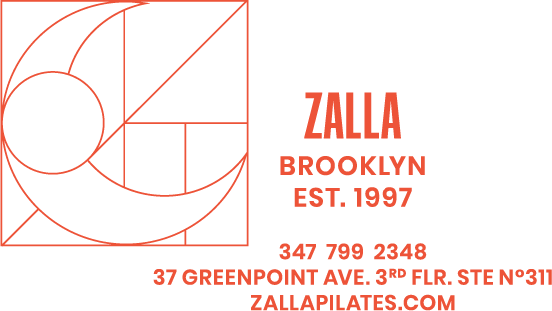 Jessie Zalla is the owner and director of Zalla Pilates located in Brooklyn, NY. She has taught Pilates, Anatomy, and Dance for over 18 years and currently travels teaching her workshop "Out of Your Joints and Into Your Muscles" to all teachers looking to deepen their practice. Her style of teaching draws from a deep knowledge and practice of anatomy, her experience as a professional dancer, her intuitive eye and her open communication with her students. Jessie is committed to spreading the very heart and soul of the Pilates method motivating her students to detoxify with deep breath, oxygenate with an internal shower, move their spines with grace and ease and to become uniformly developed and strong in both body and mind. For Jessie, Pilates is as much about a new self-awareness as it is about movement and exercise. Jessie cultivates in her students the ability to perceive, identify, and direct their own bodies with precision, subtlety and grace. Kristine was trained in the esteemed classical tradition of Romana Kyrzanowska by Rachel Taylor Segel and Amy Taylor Alpers of The Pilates Center in Boulder, Colorado. She is a teacher of students from novice to advanced who are looking to deepen their practice and understanding of Pilates. Kristine was first introduced to Pilates while pursuing her Bachelor of Fine Arts degree in Dance and Choreography at the University of Montana in Missoula. Since that introduction in 2002, Kristine's passion for movement and learning led her to the renowned Pilates Center of Boulder, Colorado to continue her study of Pilates. She completed the Advanced Teacher Training Program in 2009. Since completing the program, Kristine has continued her study of Pilates, anatomy and functional movement by attending various workshops, extensively reading and exploring with her coworkers and clients as well as attending the annual Pilates Method Alliance conference. Kristine received her Certified Pilates Teacher certification from the PMA in 2013. Also in 2013, Kristine became a Host Advisor for The Pilates Center and currently trains teachers by facilitating bi-monthly discussions on anatomy, movement skills and teaching skills. In 2017, Kristine completed TPC's Master's Program and became a Licensed Teacher Trainer, she is currently the only TPC Licensed Teacher Trainer in New York City. Becca Jane completed her comprehensive Pilates teacher training certification at BodyTonic Pilates, through the lineage of Romana Kryzanowska. In addition, Becca Jane holds a Master of Fine Arts from Parsons School of Design in NYC. Her Pilates journey began as a graduate student when she realized the importance of not only nourishing her mind but her body. Pilates became a way to find balance. She is passionate about helping people live healthier and more peaceful lives and views the classical Pilates method as a system that can be tailored to every body. Becca looks forward to meeting each client where they are and supporting their personal path toward physical fitness, inside the studio and beyond. She helps her students use Pilates to promote overall heath, improve strength, flexibility and achieve better posture. When not in the Pilates studio, Becca enjoys her work as an accessibility professional supporting neurodiverse college students. Raquel came to pilates in 2013 as a way to channel her many trainings of the body and found a modality to call home. As a teacher she is interested in guiding her students through finding greater mind-body integration, feeling empowered, grounded, and fully in charge of their bodies. Raquel finds that Pilates is a grounding practice that keeps her body strong and her mind alert, while creating a space for breath, joy and a sense of adventure. From São Paulo, Brazil, Raquel moved to New York in 2010 after getting a Bachelor’s degree in Dance from PUC-São Paulo. Since then she has trained dance at the Merce Cunningham Studio, Laban/Bartenieff Institute of Movement Studies, and became a Pilates Instructor from Bodytonic Pilates Gymnasium in 2015. Besides teaching Pilates and Movement, Raquel is currently diving deep in practicing Reiki, Astrology, and Herbalism, as a way to recognize the human body as part of nature, investigate how movement can be a powerful path for self-healing, and self-healing a revolutionary process for greater transformation. Allyn comes to Zalla Pilates from a dance and movement-based background, and a passion for living a functional and healthy lifestyle. She received her Comprehensive certification through Core Pilates NYC, and has been a Pilates instructor throughout NYC since 2014. When she's not in the studio, she's working with adult learners at CUNY in all forms of workplace communication and professional development. She's excited to continue exploring Pilates, and learning from, and working with the Zalla community.